that purple coat is amazing, i really love how coloured fur is in for this autumn/winter. it reminds me of this amazing navy one i got outbid on months ago, and ever since i’ve looked for an alternative one. my niece decided to put her legs in the arms and walk round like a purple yeti for most of the day when it arrived at my house. 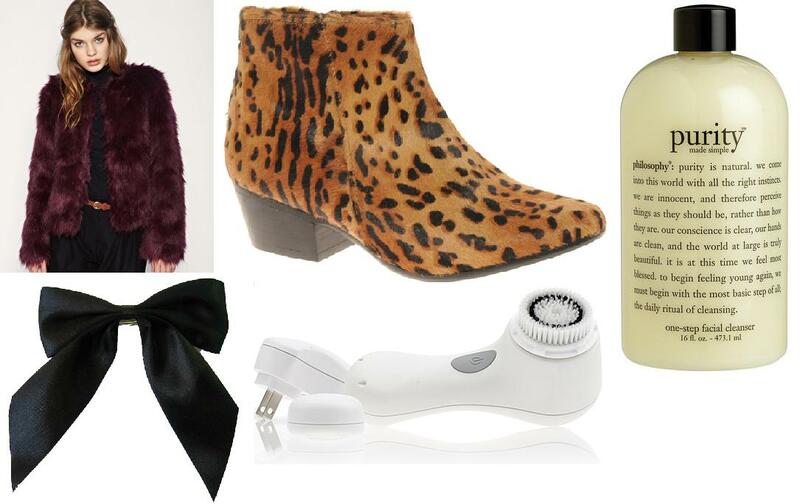 the leopard boots are literally to die for. i hesitated buying them because i never usually pay that much for shoes that aren’t designer, but asos had a 20% off thing going on so i decided to splurge. they’re so good with black jeans and a leather jacket, comfortable and practical. as i’ve been wearing heels a lot lately, they’ve been my little savior. philosophy purity face wash is lovely. just make sure you keep your mouth tightly closed because it tastes absolutely revolting! anyways, it seems to melt through makeup and really cleans my skin. a definite thumbs up! the clarisonic, ah, the beauty product i had been debating for months. i mentioned in a previous post that i had bought one and i will definitely do a review on it when i’ve used it for a few months. i am definitely not regretting the investment! i am obsessed with wearing bows around my neck so when i went to the cake shop with my mother and sister (they both do custom cakes) i decided to stock up as it was super cheap. love!